Have you ever sent an embarrassing message to someone or even worse, the wrong person on Facebook Messenger? How about sending something that sounded great in the moment but now feels a little overboard? Normally, you’d be in an awkward predicament, backpedaling to explain yourself but Facebook has just made our lives a bit less stressful. 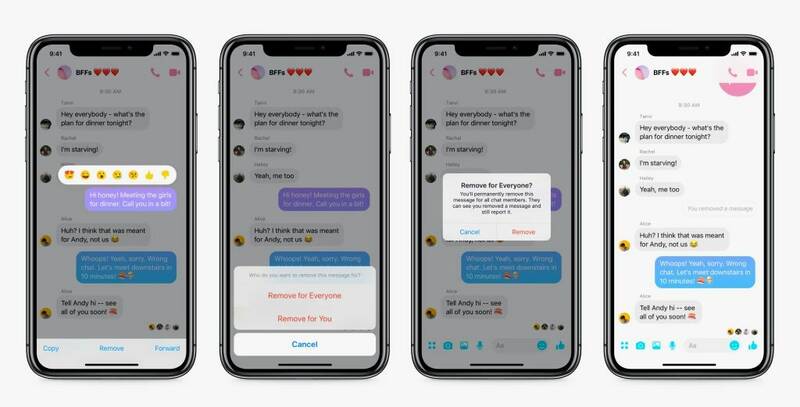 As of now, all users on Facebook Messenger should be able to remove or “unsend” messages sent through the app. If you were thinking of deleting a message from several months ago, unfortunately, you’re out of luck. The catch is that you have 10 min to make the decision to remove the message or it’ll be there for good. Other apps like Snapchat, and Instagram have had the unsend feature for a while now and we’re wondering what took Facebook so long to join the trend. To unsend a message you’ve sent, it’s pretty much identical to the other apps. Just tap or hold on the message and select the option to “remove from everyone”. You may also choose to remove a message just for yourself in case you don’t want to be reminded of a bad joke or memory. Now, the only thing to watch out for when “unsending” a message is remembering it may still show on someones notifications. It may be possible for someone see the message you’ve sent on their lock screen even after you’ve unsent the message. To take advantage of this must have feature, make sure your Messenger apps are updated! Also, what other features do you think need to be implemented next on Messenger?